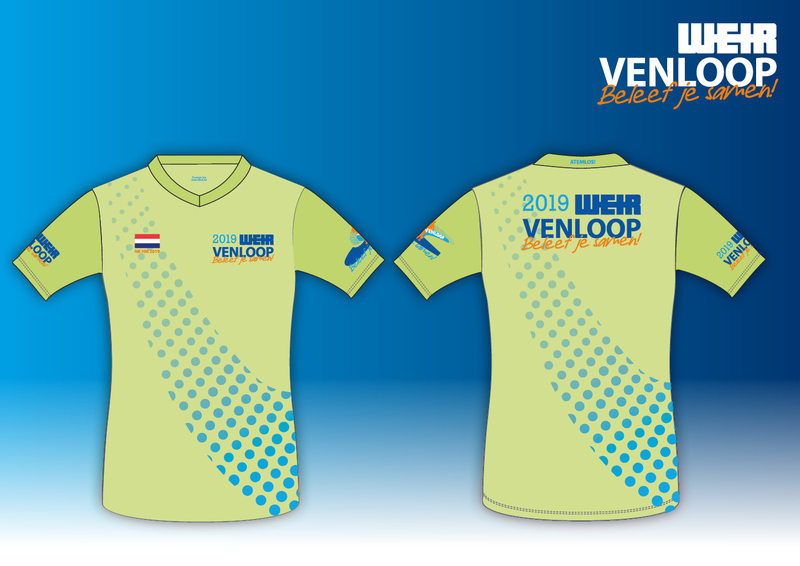 Do you want to cross the finish line in style during Weir Venloop 2019? 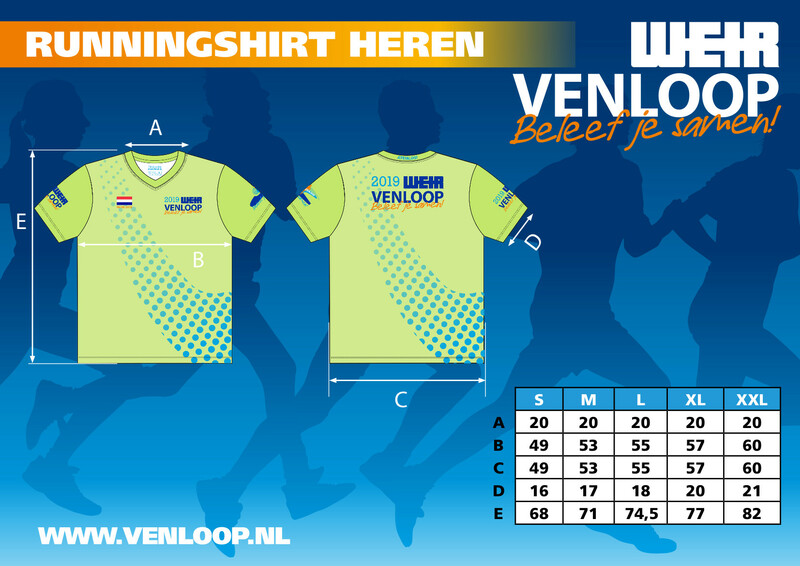 Order the Venloop running shirt in our webshop. Need helping choosing the right size? Use the table below. Proper preparation is very important for the Weir Venloop. Not only by training, but you’re your equipment. Regardless of the distance you run, proper equipment is the basis for successful training and running. Listen to your body, try different options in terms of clothing during training. Please bear in mind that runners often dress too warm and then overheat during the run. 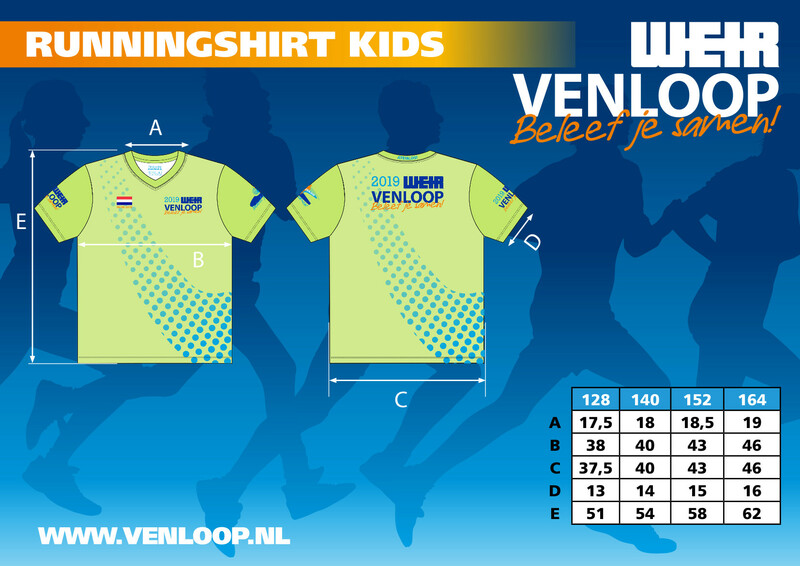 Please pick clothes that will be suitable for the weather conditions during upcoming Venloop. The weather in March is often changing, therefore keep an eye on the weather forecast. A good pair of running shoes is perhaps even more important than good clothing. Visit a specialist shoe shop for advice. A specialist shoe shop will also carry out a special analysis of your running style. Good footwear will prevent injuries of your feet, ankles or knees. Even back and neck injuries may also be the result of incorrect, or old, running shoes. Also consider good running socks! Running socks have fewer seams than normal socks to minimise the chance of irritation. They are made from modern materials for optimal moisture regulation.